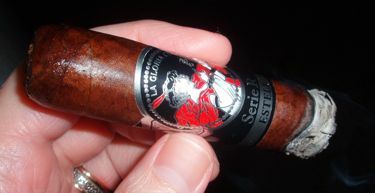 La Gloria Cubana has always been associated with the Dominican Republic, so two new blends rolled in Nicaragua are an interesting development for the company. Both blends are in the “Serie R” line, and true to that tradition they’re all wide bodies. The “R” stands for robusto, even though ring gauges for these lines generally exceed the familiar 50/64 inch robusto size. Both blends are Nicaraguan puros concentrating on the flavors of leaf grown in the Jalapa valley. What distinguishes them is the wrapper — the Serie R Black features a Jalapa ligero, while the Esteli line uses a Jalapa Sol wrapper. Tobaccos from Jalapa tend to be a little softer and less spicy than those from Esteli, even though these areas are not geographically all that distant from one another. One of my favorite cigars in recent years is Carlos Torano’s Single Region blend from Jalapa, and I’ve noticed that Nicaraguan cigars that utilize leaf from this area fit my criteria for a great smoke: they tend to be rich in flavor, medium to full in body, and usually won’t knock a lightweight like me into the next county. 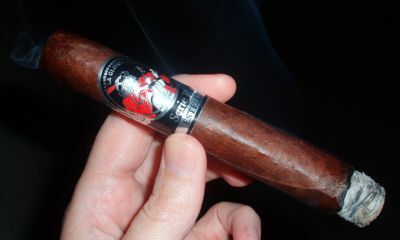 The LGC Serie R Esteli No. 54 appears princely with its dark colorado maduro wrapper and black and silver band. The wrapper is quite oily with some fine veins, and its rich hue makes an impression. The roll is slightly irregular, but solid, and the cap is bit messy yet entirely functional. (If something can be called functional by dint of its removal.) The draw is excellent, and the burn is extremely slow. I was able to stretch this cigar out for a good hour and fifteen minutes and never had a burn issue the while. The 54 opens with a sweet and woody character, punctuated by leather and spice. The woody element is sweet and clean, reminding me of juniper more than the cedary aroma typical of so many cigars these days. This toro seems to be more complex in its first third than it is later on, which is a bit unusual, but this may be in part due to the amount of time it takes to smoke. After an hour my taste buds get a bit fatigued and I’m less able to detect subtleties. The smoke is medium in body and quite smooth. The flavors and aromas presented in the first third reappear in the middle section, though the taste is less clean and takes on a meaty, barbecued tang. The final section continues on that path but the sweetness wanes after a brief flirtation with chocolate. La Gloria Cubana has a great new blend here, especially for fans of the rich complexity of Jalapa tobaccos. The combination of wood and leather with just the right amount of sweetness really hits the spot this time of year. I would love to see this cigar in a standard robusto size, but the trend toward large ring gauges is apparently no longer a trend and is now simply what the market is demanding. So I will rest content with the relatively svelte 54. 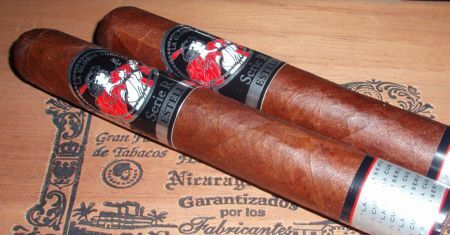 The Serie R Esteli is available in boxes of 18, and singles go for around $6.50 USD. Add two bits for the 60, and a buck for the 64. That’s a very respectable price for a cigar of this magnitude and quality. Special thanks to General Cigar for providing samples for review.